If you’re interested in learning more about breeding show guppies, you probably noticed there isn’t much good information out there. I can’t remember the last time a decent book about guppies was published. The only books I can even think of that were written in the last couple of decades by an IFGA show winning guppy breeder were by Stan Shubel. One of the ways I used to learn about show guppy breeding was to go through every known IFGA breeder’s personal website and study whatever information I could locate. Not a great way to get a comprehensive education on breeding guppies. But there isn’t much good information out there. 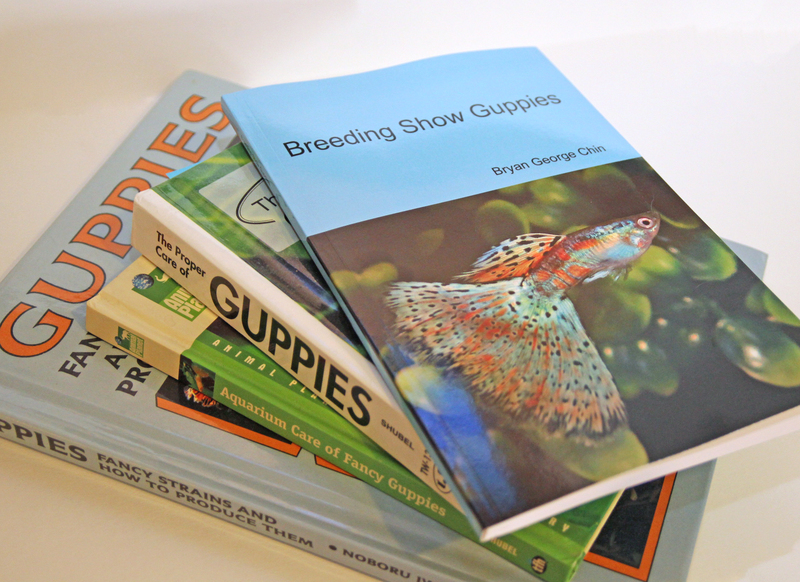 My only regret about buying a copy of Bryan Chin’s book Breeding Show Guppies this week is that I didn’t have a copy years ago when I was getting serious about the hobby. I’ve been personally using Bryan’s methods to breed show guppies for the last two years or so, and it has pushed my breeding program ahead by 5-10 years. He basically saved me thousands of dollars on breeding stock and years of work by answering questions that could only be answered by maintaining a lot of fish and doing a lot of crosses. Bryan is also the unofficial IFGA guppy photographer. If you’ve ever Googled show guppies, you are certain to see his guppy photos on Google images. This is really important for someone producing a book. Good photos help you understand what a good show guppy looks like. -Read the history of Bryan’s show guppy breeding program. It’s fascinating to see how other people have built an award-winning program from the ground up. -Completely new ideas about raising show guppies. Doing things the same way as it has always been done is nice. But if you know how to break the rules, you can get some unexpected and dramatic results. I’m the king of breaking rules with show guppies. So it’s refreshing to me to hear about someone doing things a little differently. -Illustrations that are easy to understand. -Useful information about how show guppies are judged on the bench. -Some basics in genetics. It’s difficult to raise show guppies if you don’t know the outcome of your cross. Genetics helps you predict and manipulate that outcome. A basic understanding of genetics will reduce your failure rate and help give you the fish you want. If you want a thorough, information “insider’s guide” on breeding show guppies, this is a MUST-have book for your collection. Let’s face it, you can easily spend upwards of hundreds of dollars on show quality fish. But it’s all a waste if you don’t know what to do with those fish. Trust me when I say, the top guppy breeders make it look easy. It is not easy! I always say you need to be able to raise fish, know genetics, be an amateur veterinarian, know show standards, etc. etc. Most people who master show guppies actually deserve an honorary Ph.D.! This book will give you a solid foundation to breed show guppies. You may not digest everything in one sitting, but it’s an excellent reference guide that you can refer to as necessary. You can find Bryan’s book on Amazon by clicking this link. This book is now on our Xmas list thanks to this recommendation.